The simplest Facebook Live and YouTube encoder for live streaming to YouTube and Facebook. Live streaming shouldn’t be complicated! 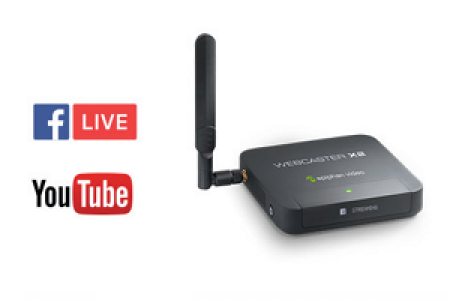 Epiphan Webcaster-X2 is a dedicated encoder designed from the ground-up for live streaming to YouTube and Facebook, making streaming a breeze. Pair your device once with your accounts and it remembers your settings for all future streams. Monitor your live video and see viewer comments and reactions in real time. Simply connect a display to the Webcaster X2’s HDMI OUT port.